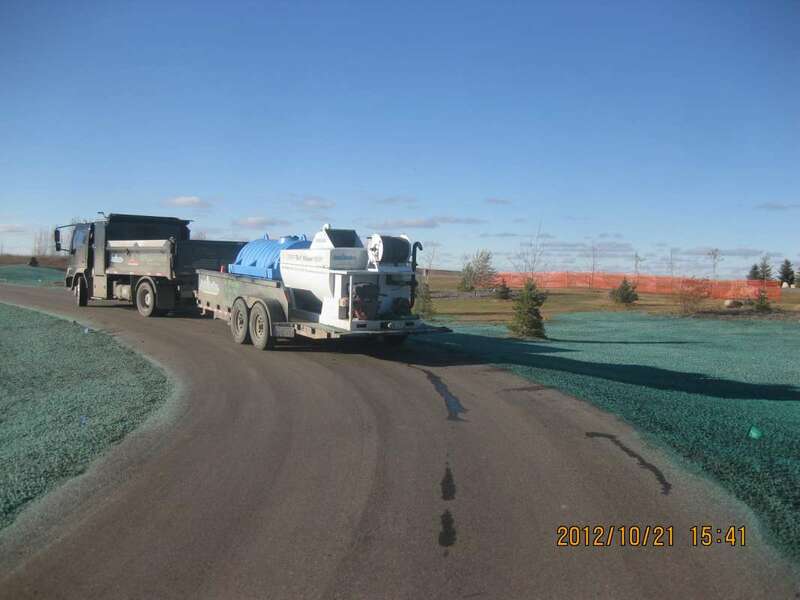 Hydro-seeding - Grounds Master Inc.
Hydroseeding, also referred to as “hydromulching”, is a grass planting process. 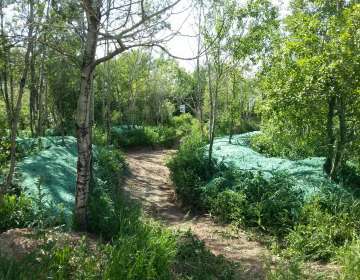 This grass planting process is more effective than conventional seeding and certainly more economical than regular sodding. 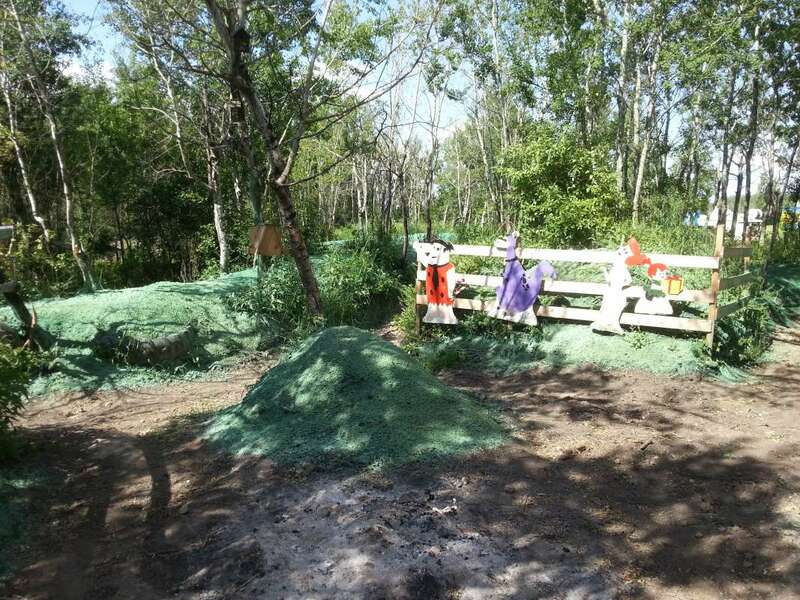 The process begins by mixing seed, fertilizer(s), tackifier (natural adhesive), and 100% wood mulch with water in correct proportions inside a hydroseeder tank, then sprayed onto the ground. The material is often referred to as a slurry. Grounds Master Inc. recommends using wood mulch over paper or straw mulch, as it is far superior in its erosion control characteristics and is able to hold the most moisture for the newly germinating seed. Once applied to the soil, the material enhances initial growth by providing a micro-environment beneficial to seed germination. 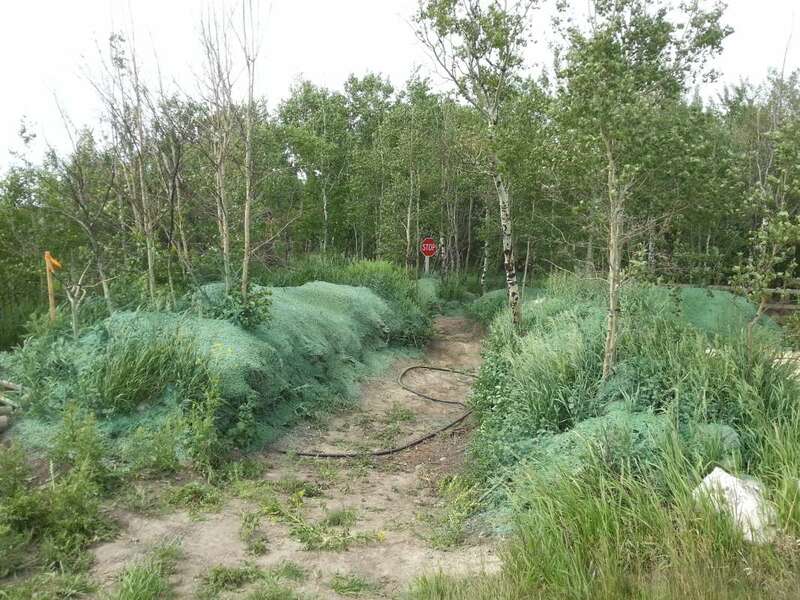 The popularity of hydroseeding in Canada is growing. 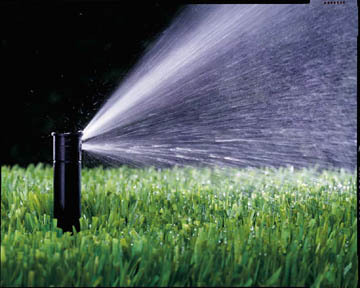 Customers notice that you spray it on, and before you know it, a beautiful, more durable lush lawn is growing. 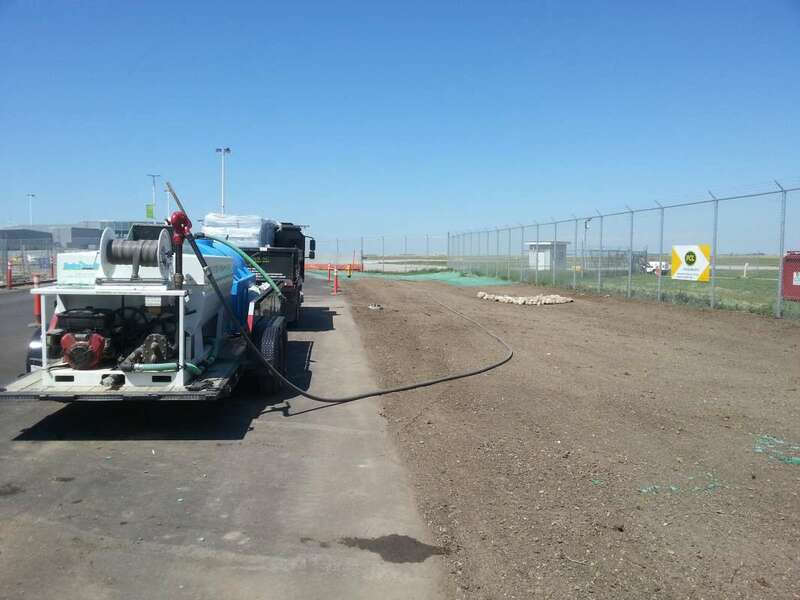 There are reasons hydroseeding works so well. The seed is suspended in a nutrient rich slurry. The contact of the seed with the water in the machine triggers the germination cycle. The mulch layer seals in the moisture, holds the soil in place and acts like a “mini-greenhouse effect”. The seed is at an ideal depth for good results. 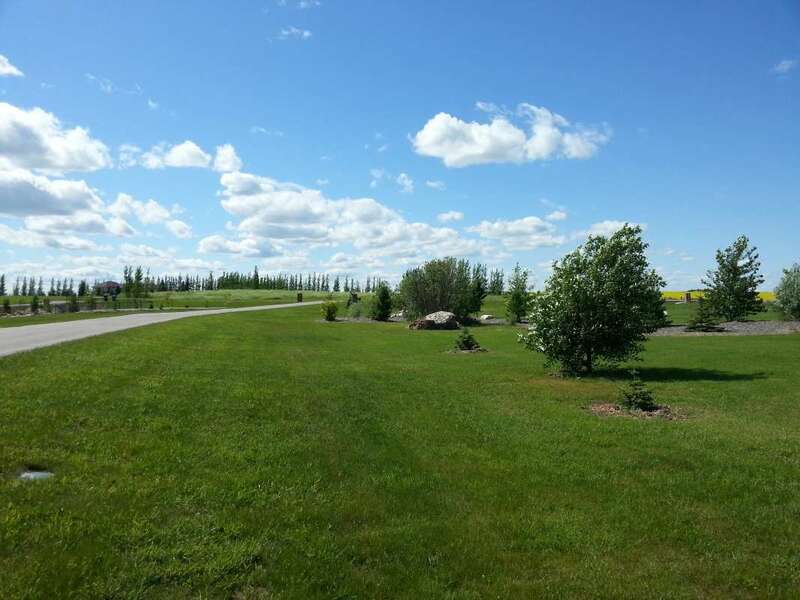 The conditions are right to produce a lush green lawn in a much shorter time period than what is often seen with traditional broadcast seeding. 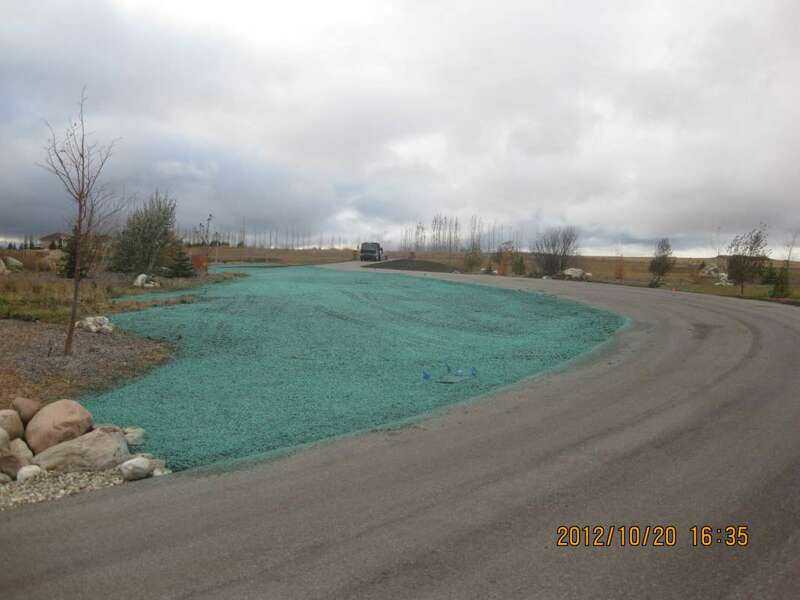 After hydroseeding, your property will have a nice green appearance from the mulch coloring in the spray mix. 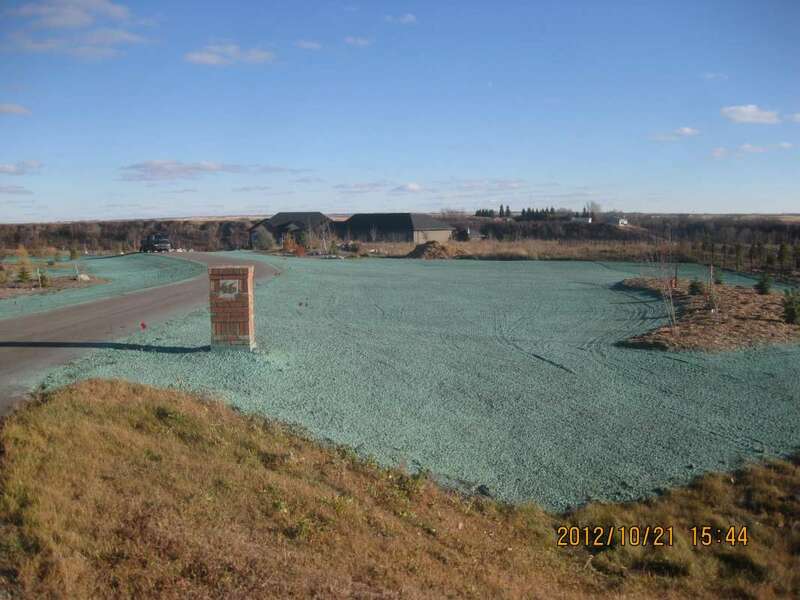 The coloring is temporary for the application process and will fade into a light brown color while the grass seed germinates and grows. Warm soil temperature and moist conditions promote faster seed germination. Seed bed conditions (soil preparation) also affect the seed growth rate after germination. 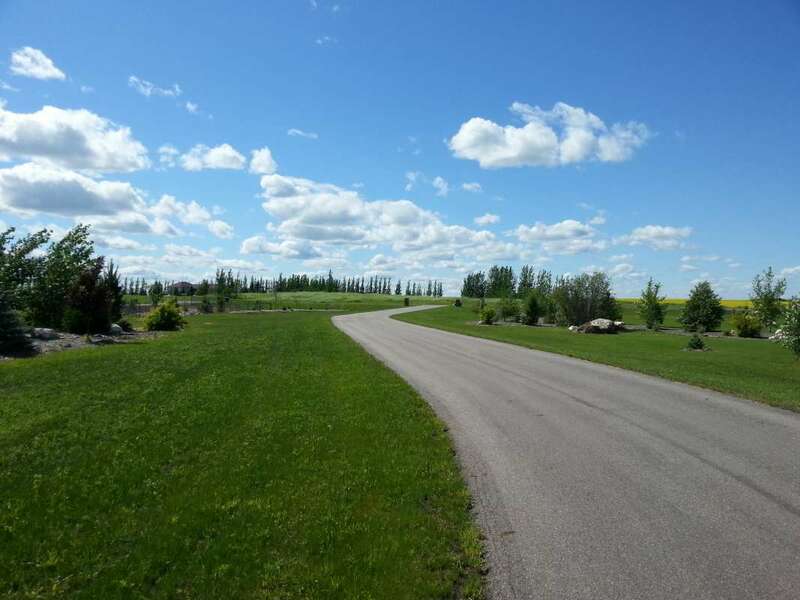 When all the conditions are favourable, grass may require its first mowing and have excellent initial coverage in to 4 to 6 weeks. NOT INTERESTED IN LAYING SOD? 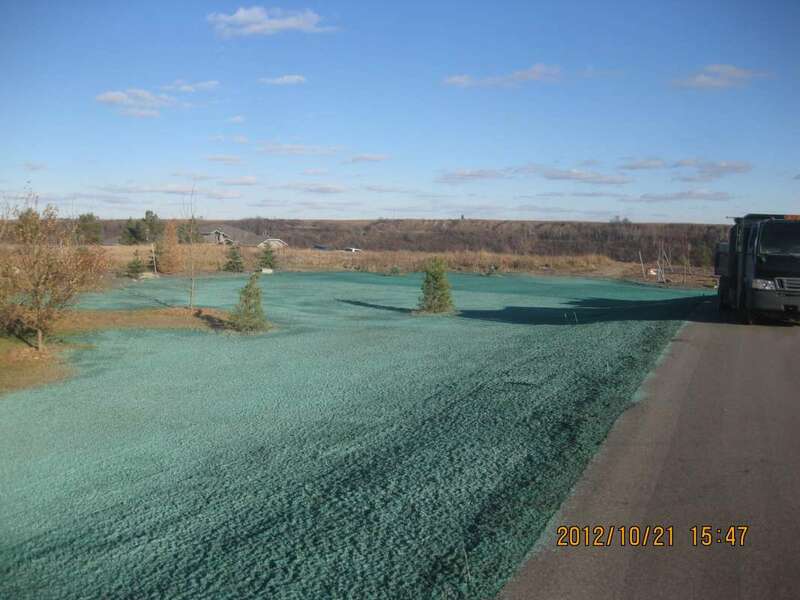 Hydroseeding is the answer. 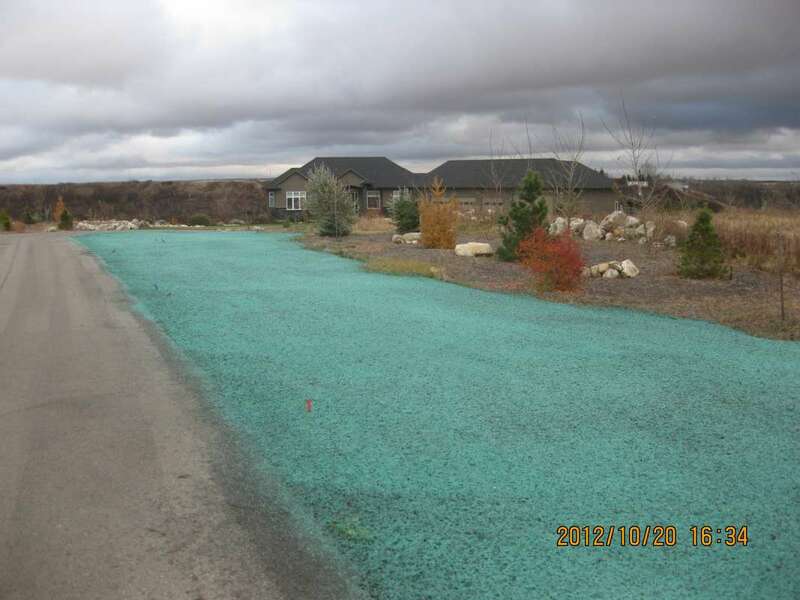 Hydroseeding is a fast, cost-effective way to have a new lawn. The cost to have your lawn hydroseeded can be up to 60% less than the cost of installing sod, depending on the size of the area that needs to be hydroseeded. 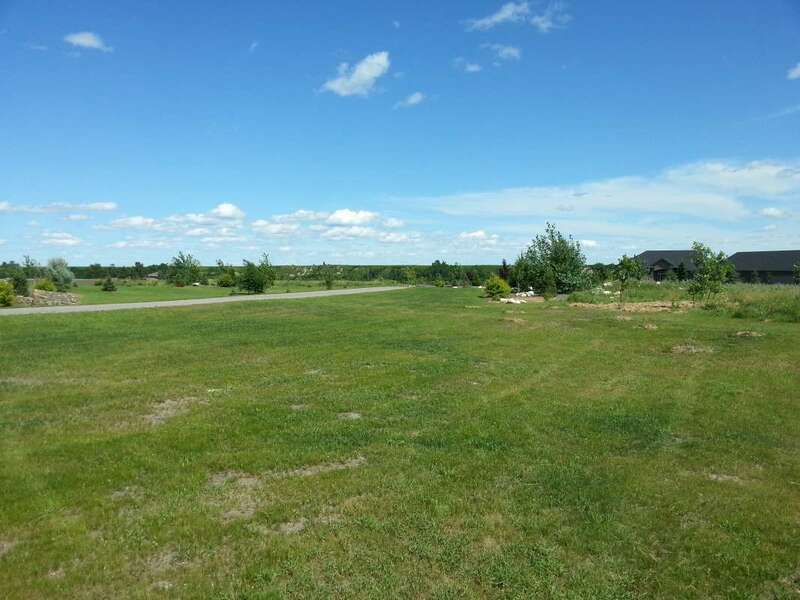 Soon you will have a beautiful lawn, with no need to worry if the sod will take. 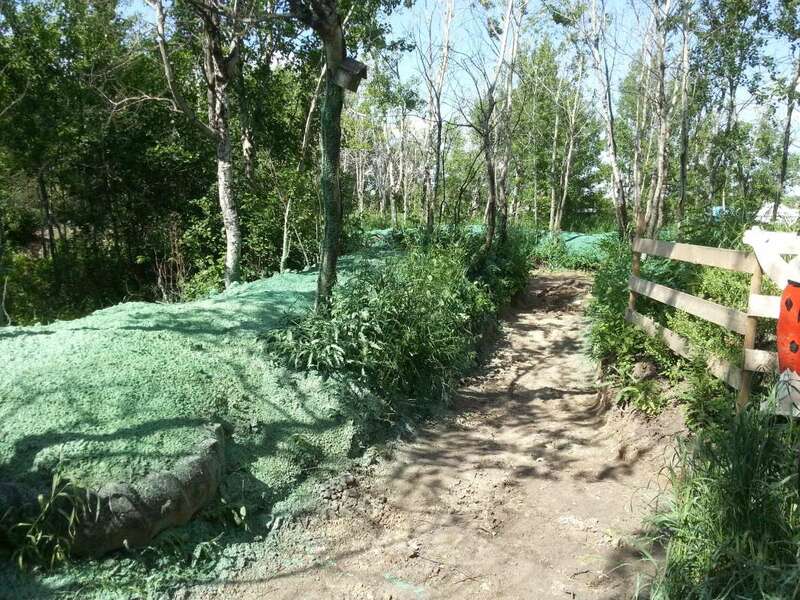 Hydroseeding also eliminates the backbreaking dirty job of laying sod by hand. 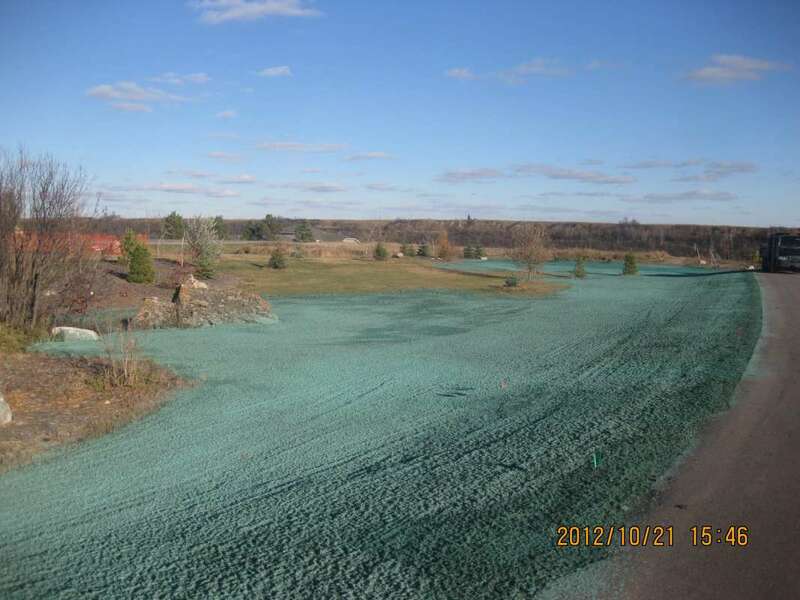 *Prices for standard hydroseeding jobs vary from approximately $0.12 – $0.20 per sq/ft. depending on the square footage of the area and product used, with a minimum charge of $650.00 for smaller projects under 3,000 sq/ft. 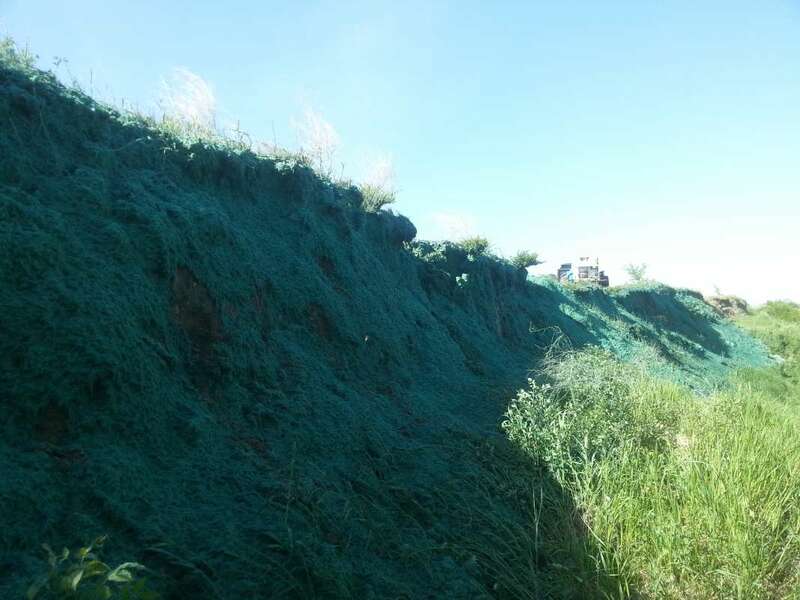 Projects that require extreme erosion protection and mulches capable of handling those conditions have a price range that varies from $0.18 – $0.35 per sq/ft. 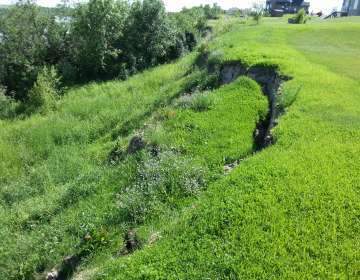 Examples of such projects would included vertical embankments with slopes of 4:1, steep ditches that experience high erosion, or drought-ridden sites where grass seed needs to be secured to the soil for prolonged germination periods of 18-24 months. 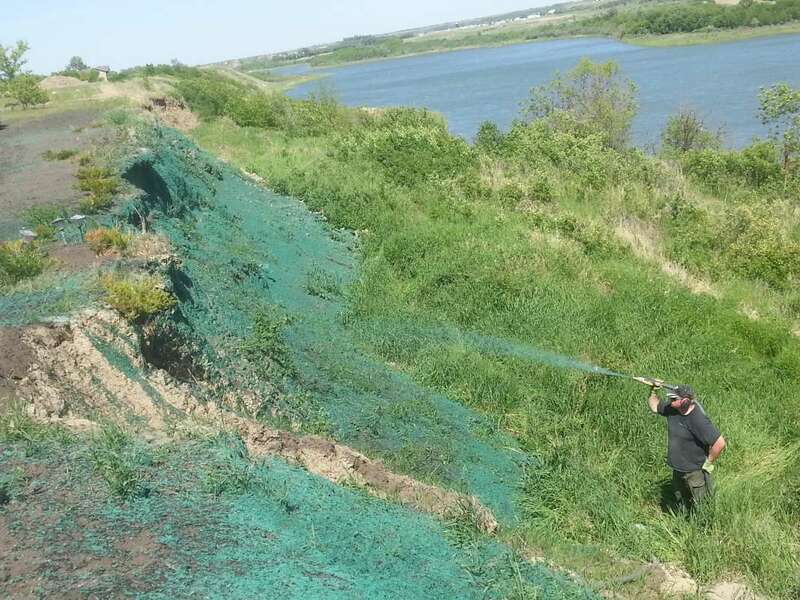 Projects located outside city limits will have to take into consideration the availability of a water supply (example: rural water fill stations, lakes, streams, dug-outs, ponds, or slews). 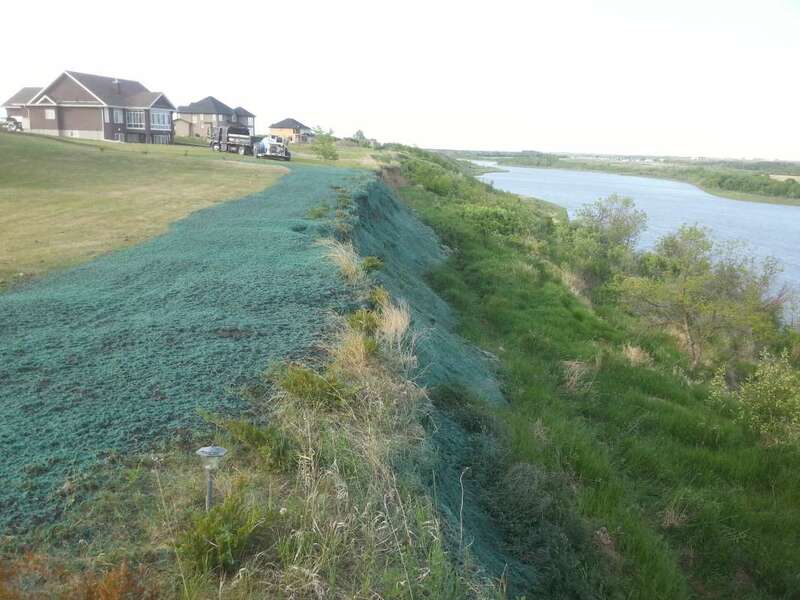 Standard residential water supply lines (3/4”) will not be sufficient for the Hydroseeding process. Travel charges apply for locations outside city limits. 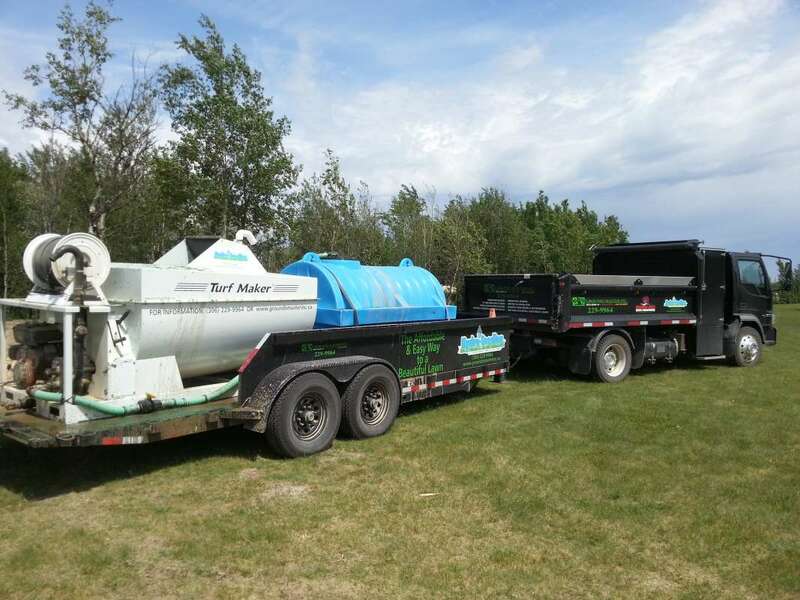 Grounds Master Inc. provides hydroseeding services to all sizes of projects, from residential lots and acreages to large construction and reclamation projects. 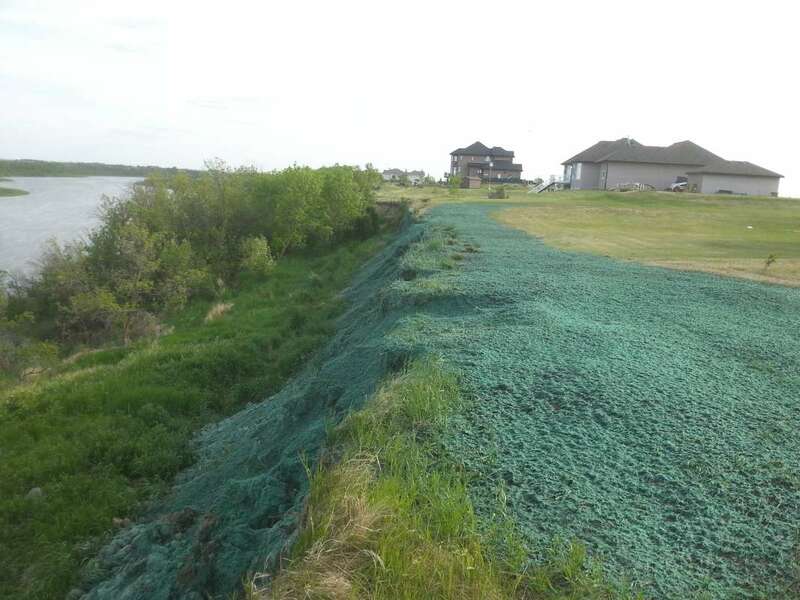 Hydroseeding also provides excellent erosion control. 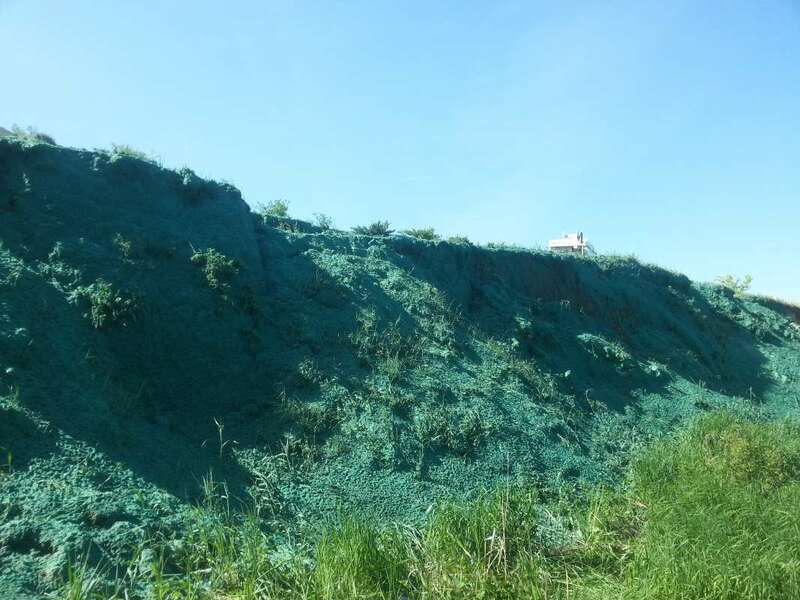 You can choose the best choice for coverage, including fast germinating grass seed, wildflowers, or any other crop that will stabilize a hillside. 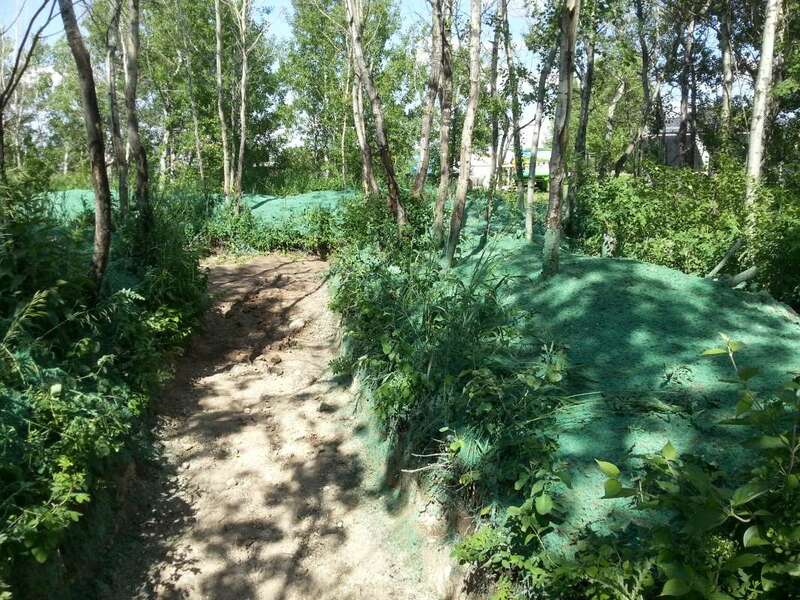 Additionally, a stronger layer of hydromulch, such as a Bonded Fiber Matrix blanket (BFM) or a Flexible Growth Medium (FGM), along with a special tacking agent to bond the seed to the soil, can be applied. 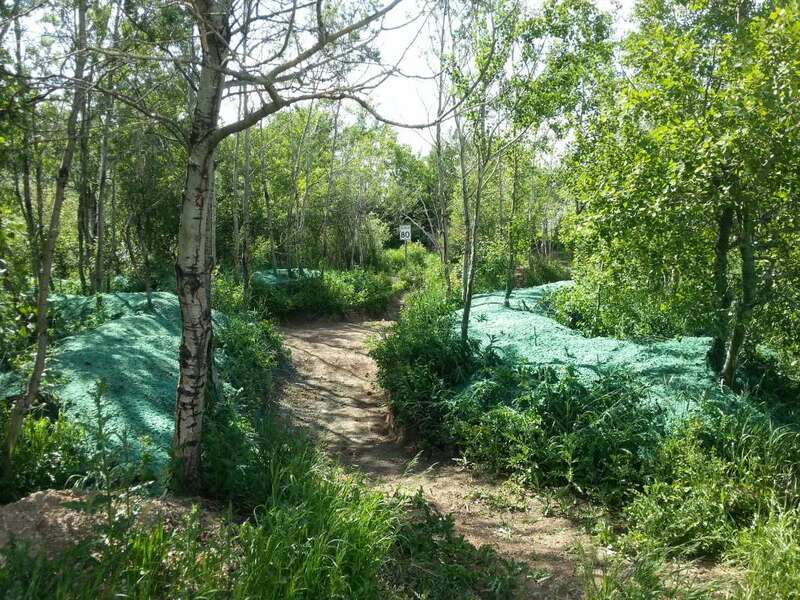 Along with the included fertilizer(s), this version of an erosion control blanket will withstand the harshest of conditions, thus allowing the seed to effectively germinate and grow on a slope without it being easily washed or blown away. 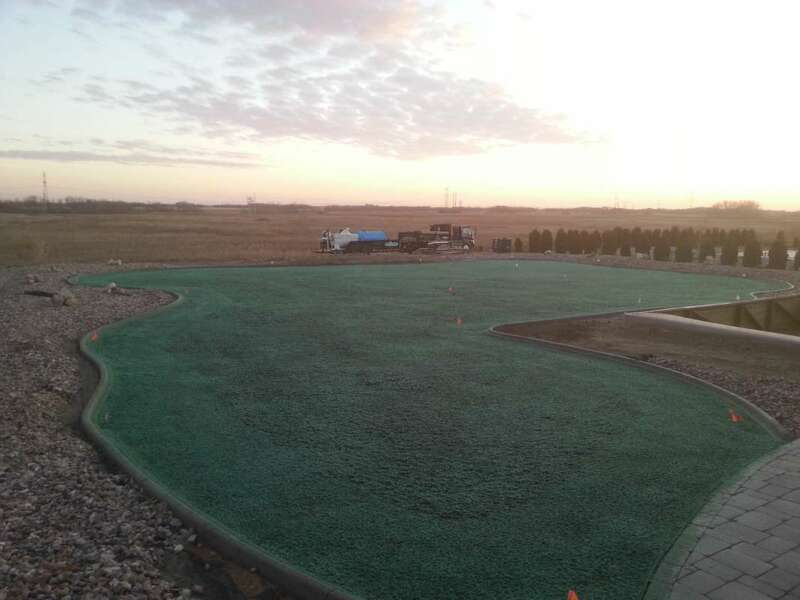 Your hydroseeding or hydromulching application contains grass seed that requires a continuous supply of warmth and moisture. This moisture must come from rainfall or watering. It is not likely that it will rain every day for the following weeks, so be sure to water frequently enough to keep moisture in the soil. A new lawn should be watered each day for the first 2 weeks, with a watering cycle of 15-60 minutes for each watering period (depending on area size and sprinkler type). The lawn should be kept lightly damp and water should never run or puddle on the lawn. Watch the weather and adjust your watering to keep the mulch lightly damp, not soaking wet and muddy. Sitting water that has been allowed to pool from overwatering will damage grass seed. Once the first mowing is completed, watering is adjusted to 2-3 times per week, and applied heavier. Most customers will actually use much less water establishing a new hydroseeded lawn when compared to the watering requirements needed to establish sod. A new lawn should be mowed as soon as the grass blades are approximately 3-4 inches high. 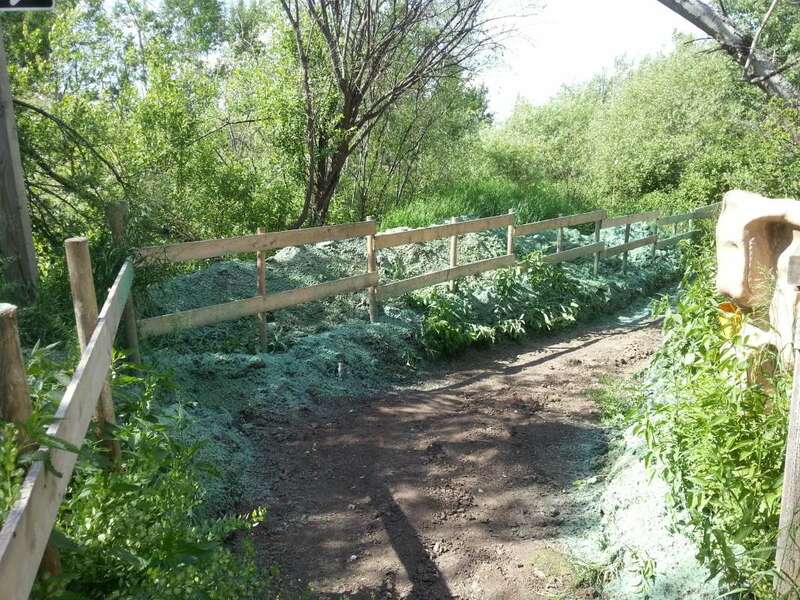 Delaying the first cutting will only encourage weed growth. Mowing properly will play a vital role in controlling weeds and encouraging the new grass to choke out these temporary weeds. The one-third rule when mowing must be followed. 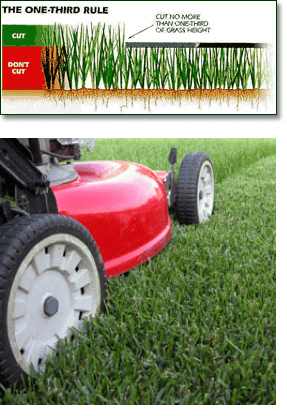 With the lawn mower blades sharp, no more than 1/3 of the grass height should be cut at any one time. Always ensure that the new grass is cut on the mower’s highest setting. Subsequent cuttings should be done often, with the grass clippings being mulched in — not bagged. 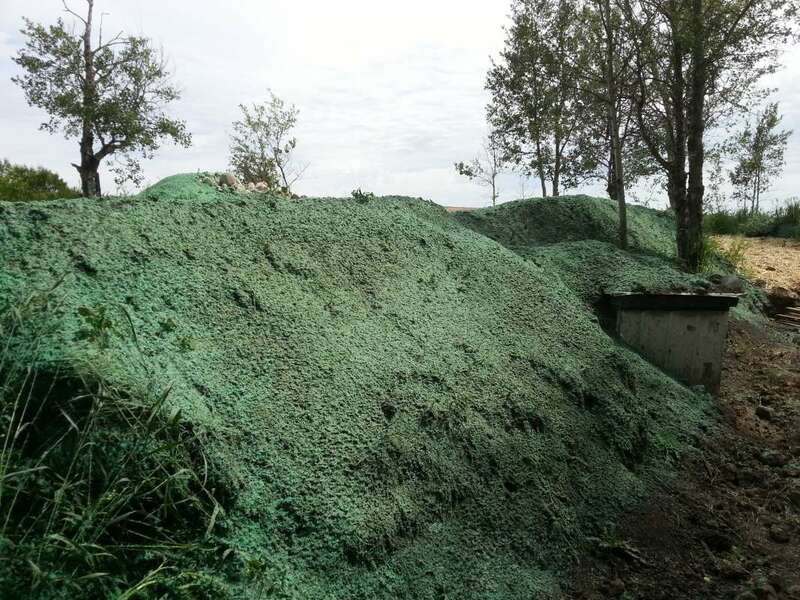 The unbagged or mulched grass clippings act as compost for the new lawn. The new grass will need an application of balanced fertilizer after the first mowing and again 30-40 days later. 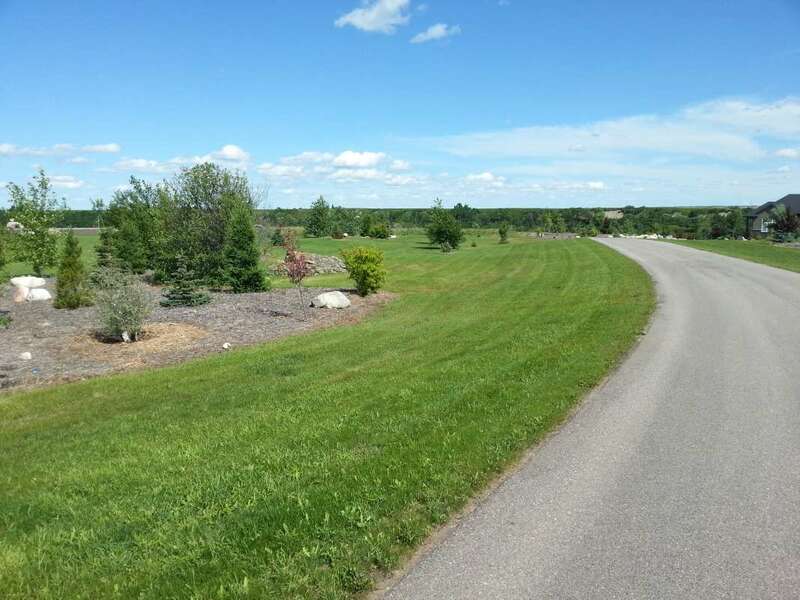 The development of a healthy lawn can be achieved through the use of 3 scheduled applications of a slow-release fertilizer throughout the season. 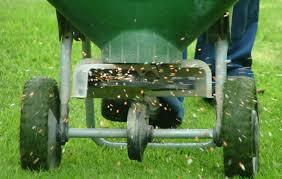 Apply fertilizer on the lawn when it is dry and then water heavily and thoroughly. Apply at rates recommended on the bag, or at a rate of about 4lbs per 1000 square foot of lawn area. Do not over fertilize or under water. DO NOT USE WEED KILLER ON A NEW LAWN. This is very serious. Weed control products will kill new grass in the first season. All soil contains weed seeds. 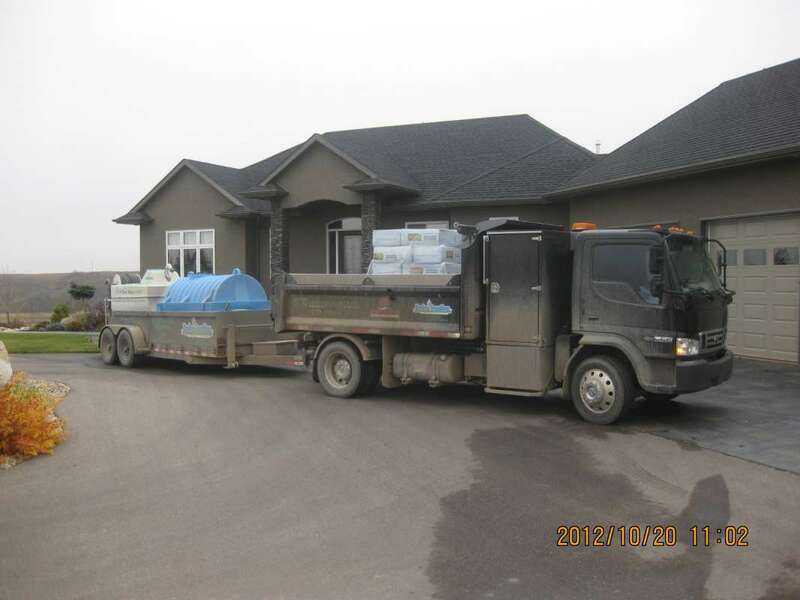 The hydroseed or hydromulch slurry does not. Weeds always germinate quicker than grass, however grass will choke out weeds as it becomes established. 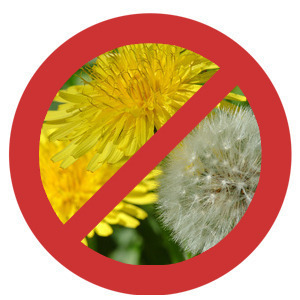 An established lawn and a proper fertilizer program will choke out any of the remaining weeds. 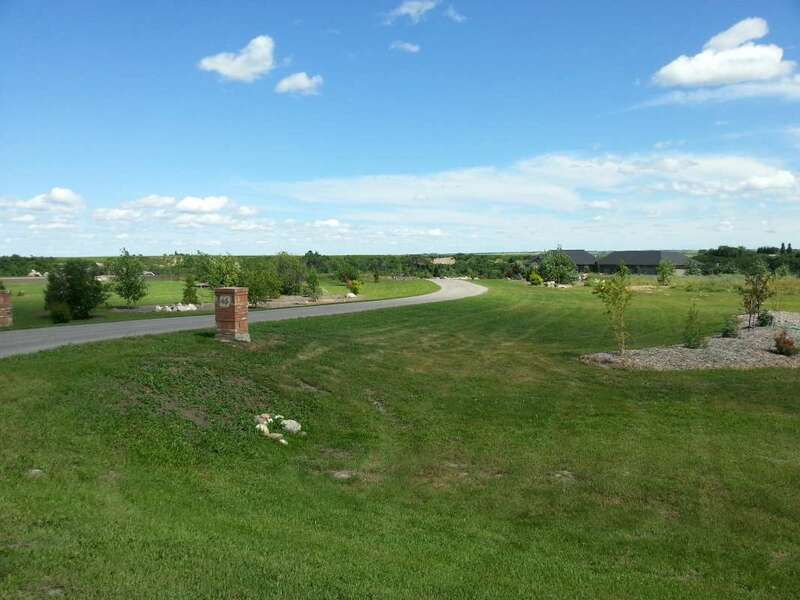 If you have questions about any of the products required for a healthy lawn, contact Grounds Master Inc. or any of the many qualified lawn care firms available in Saskatoon. 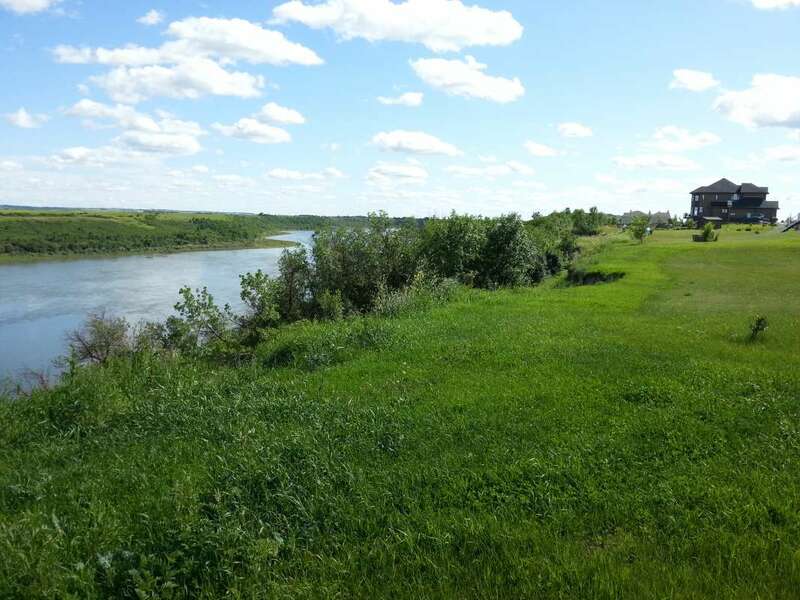 Here’s a commonly asked question: “Will I have a fully grown lawn in a few weeks?” The realistic answer is no, especially in our short Canadian (Saskatchewan) climate. The expectation for a seeded lawn to grow is often measured against that of established sod. 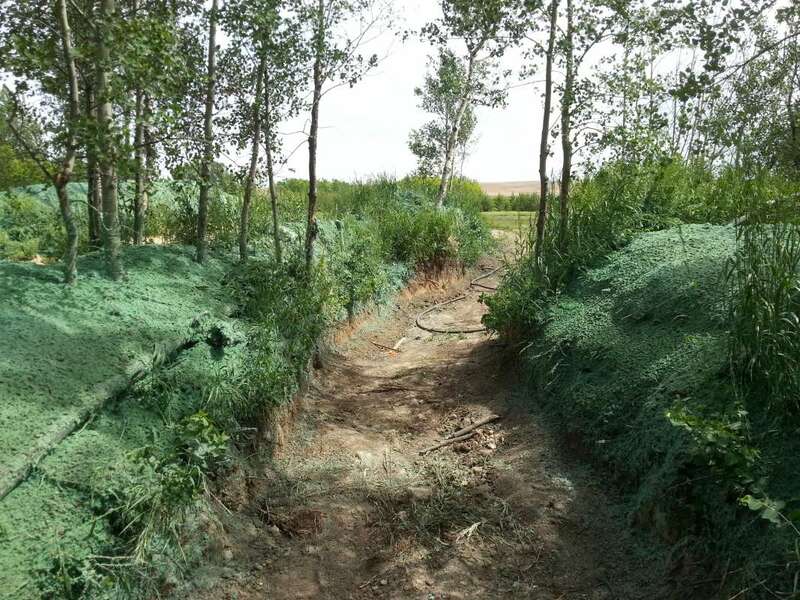 What few people fail to realize is that sod cannot be harvested until it has become fully developed, which can take anywhere from 3 to 4 years depending on the region. 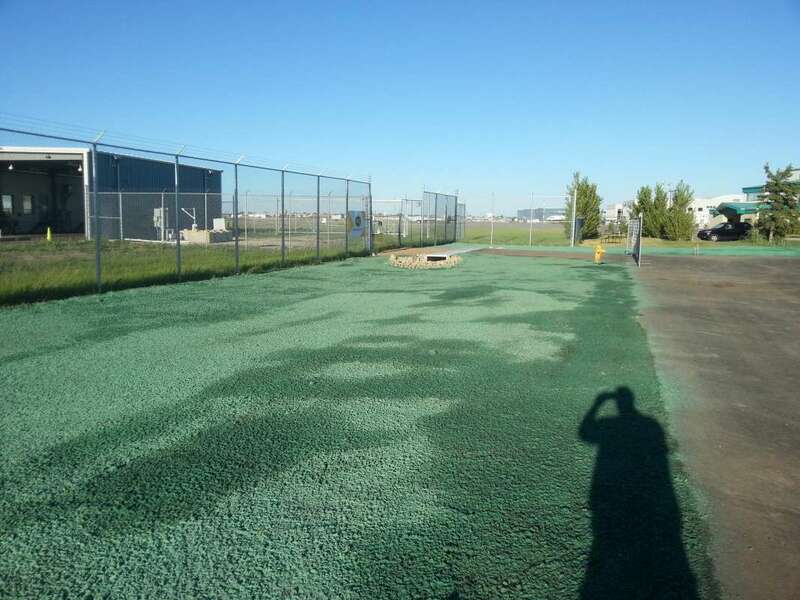 When a property has just been hydroseeded, and the growing conditions are near perfect with adequate moisture and warmth, then it is common to see accelerated grow when compared to that of regular broadcast seeding. However, when growing conditions are not favorable, with low moisture levels, extended dry spells, or seasonally low temperatures (early spring/late fall), then seed development will be affected. If the conditions are not favorable for seed germination, the seed will wait, while protected by the hydromulch until weather conditions improve. The affect that weather has on the grass development is no different than that placed on any other plant variety. A final comment – the establishment of a lawn should take into consideration the environmental influences placed on it. What is the grass intended for? 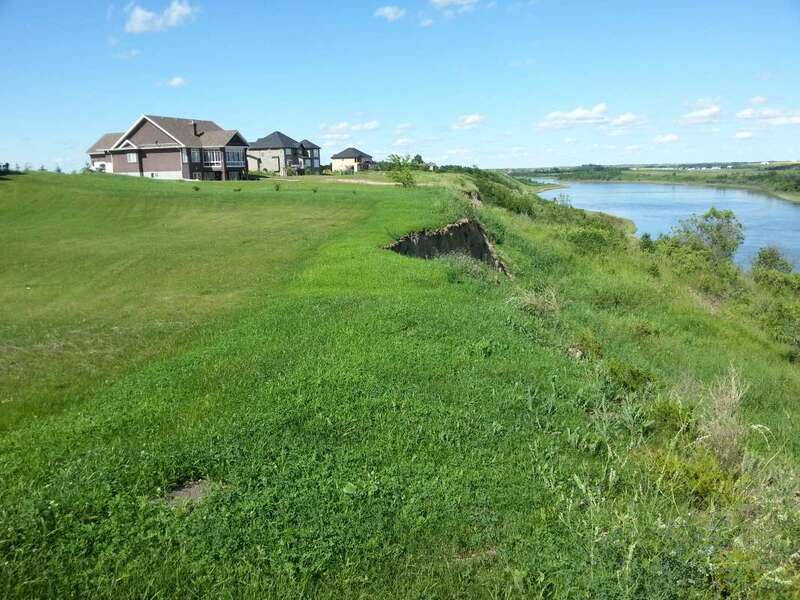 Will the new grass be used to establish a lush golf course fairway, or provide a durable play area for children in a residential back yard. Maybe the grass will soon become the play surface in a non-irrigated park, or help establish a level of erosion control in a roadway ditch or embankment. Despite what the end use will be for the grass, or what its characteristics or traits are, in the beginning, all varieties of grass seed require the same thing – warmth, moisture, and food. It cannot survive without them. **The best available method to seed a larger flat surface area takes the two seeding methods into consideration: First the area is Drill Seeded, then secondly, it is Hydroseeded. 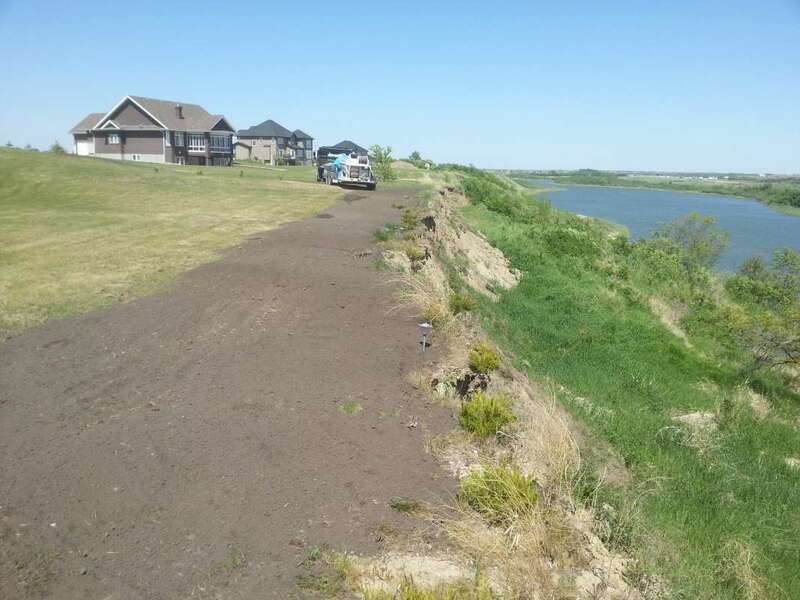 The combination of these two grass seeding methods has been proven to produce the best overall results – especially when moisture is limited and erosion control is paramount. 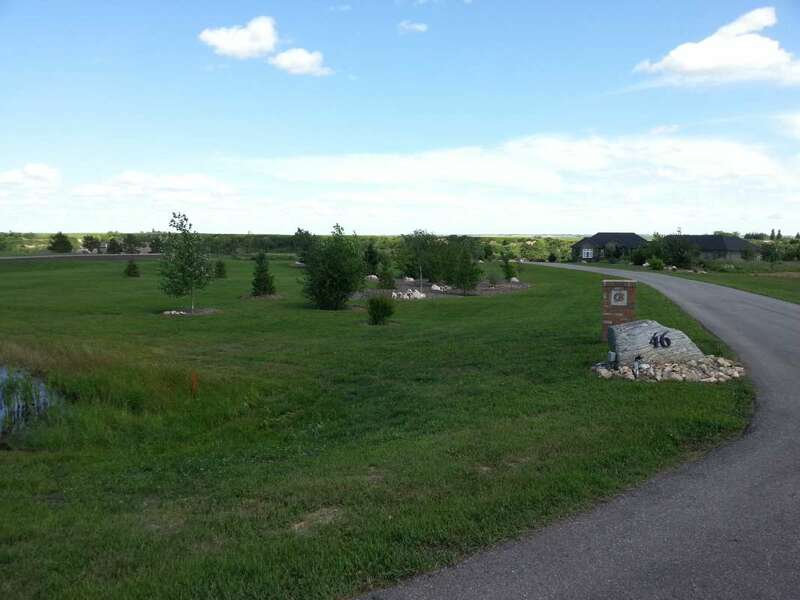 Is the area to be seeded a minimum size of 3,000 sq/ft? 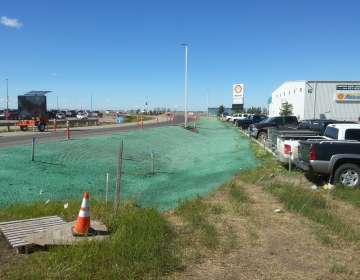 Is the minimum price of $650.00 justifiable when compared to the price of sod for such a small area? Will the area to be seeded receive a lot of foot traffic in the weeks to come? After any type of seeding, the golden rule is always to “stay off the seeded area“. 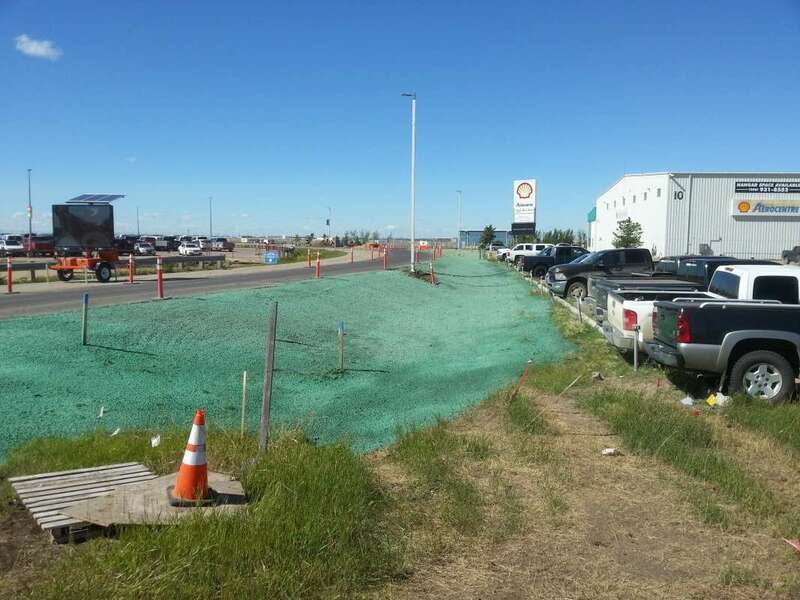 Would the installation of sod speed up your project development so that foot and animal traffic is be allowed? The seed composition of standard sod comes with a high percentage of bluegrass. This gives it a lush green appearance and soft texture. However, by design, sod grass is dependant on a life-time supply of regularly scheduled watering and will not tolerate periods of drought. 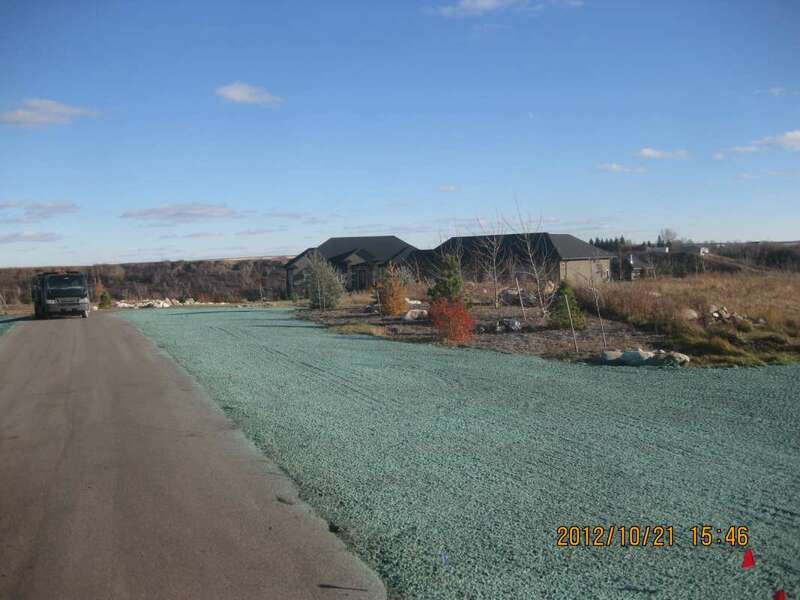 Hydroseeding allows for the seeding of any grass seed or wildflower. You can customize the type of grass for your project. Is the area to be seeded ridden with steep hills or narrow ditches? 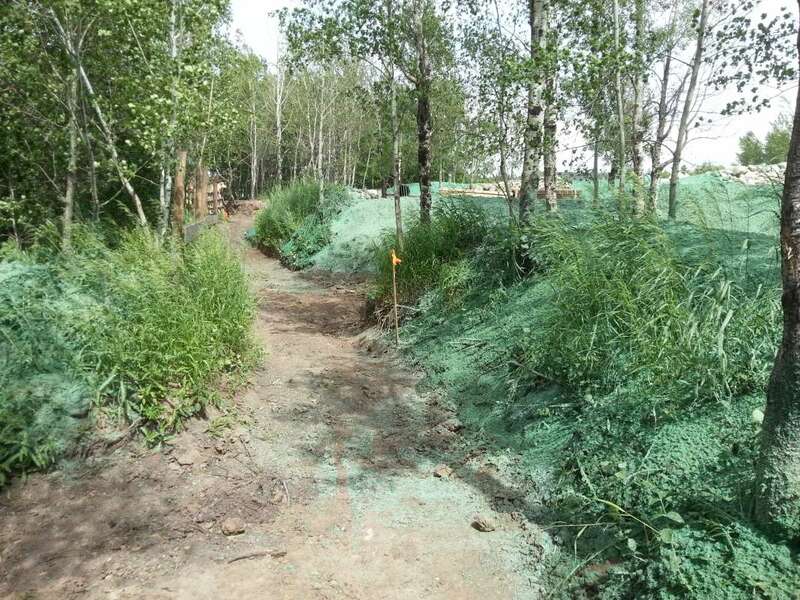 Hydroseeding was designed to handle extreme conditions where all other seeding and sodding methods would fail. Is the area to be seeded properly prepared? Do you have the minimum recommended amount of topsoil (4 inches) for the seed to develop? Have you properly packed the topsoil and then loosened the top 1/2 inch as a suitable seeded. 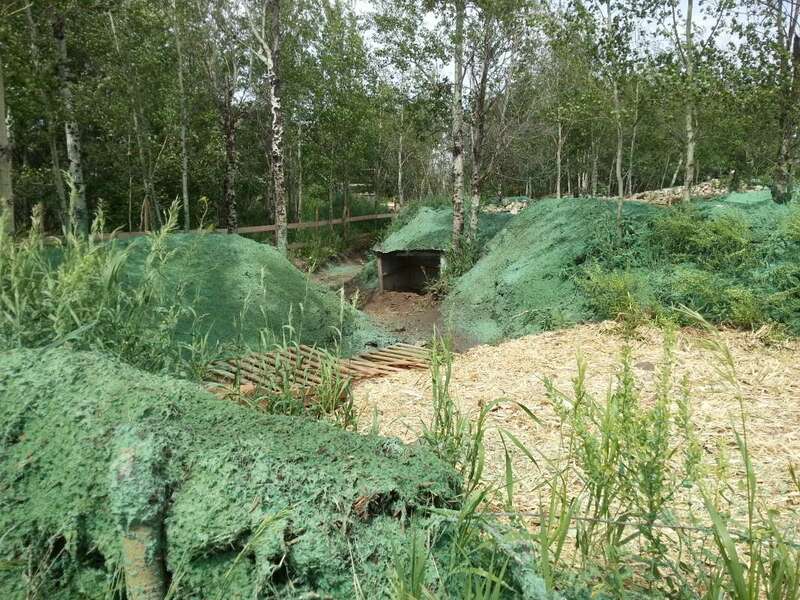 Note: You cannot successfully hydroseed over existing grass or plant material. Proper soil preparation is always required. 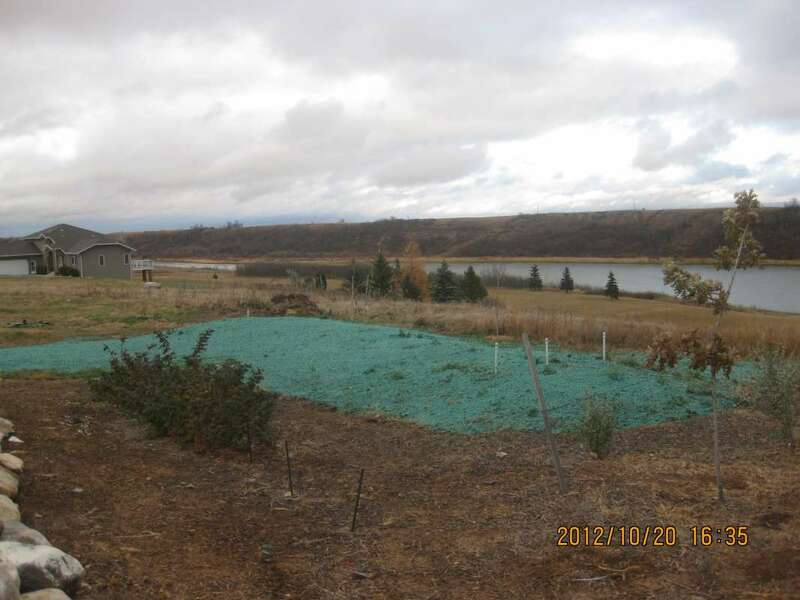 Understand that the hydroseeding process is different than over-seeding an existing lawn. 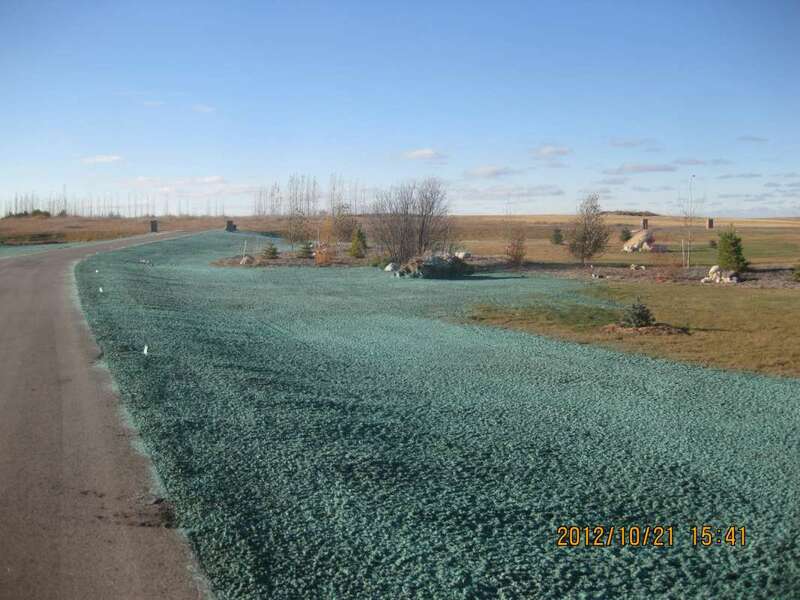 Hydroseeding can be used in over-seeding, but the soil preparation is different. Would Drill Seeding be better suited for your project needs? (See Drill Seeding service information). Is the area to be seeded very large? Drill Seeding is the most economical and effective method to seed large scale projects within a limited budget.